39 matches played in the last week! While it may be just a start, I want to commend FACEIT and everyone using the HUB for providing a new platform for community maps to be playtested. Personally, I'm optimistic that if we continue to work hard on this idea we will have a few matches being played everyday consistently. Thank you for playing games on the platform, let's keep it going, and tell your friends! Mappers: don't forget that you can pull demos from the FACEIT platform and watch them back to study the gameplay. We aim for a Map pool of 7. The maps in the pool rotate every month. The monthly 2 least played maps get removed from the pool at the end of a month and 2 new maps get added at the beginning of the following month. 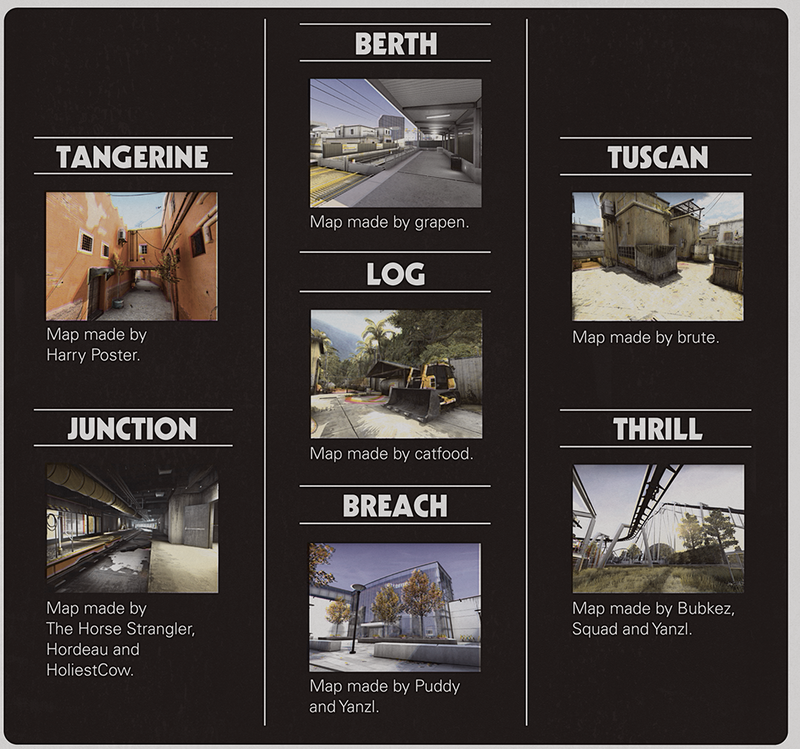 These new maps are being chosen through a poll which is prepared by Hub moderators and posted on reddit/Twitter/Hub webpage (More on that later). This poll should be under a week away from the next month to stay relevant for the voters. Leaderboard winners should receive Faceit points to help growing the Hub. This should be a win-win situation for every party involved. It draws more people towards Faceit as a community map run map pool is rare and players have an incentive to play more games and improve their skill on community maps. Events are planned as well. Each event is aimed to be half a month long (starting either on the 1st or 15th of a month) to allow consistency in the time management so players are always able to assume when new events start/maps get added to the pool. An already thought through idea for events are past Operation events. These flashback events allow players to revisit maps from old Operations. These events could be advertised through a special site on the Hub webpage similar to the official Operation webpages (http://www.counter-strike.net/operationwildfire/) and maybe even small trailers which showcase the map pools. After events, the map pool returns to the usual rotation. Hub design: The banner and Hub description (/Rules page) should be adjusted to every monthly map rotation/event. The first poll to swap out maps will then be at the end of April. Are there statistics coming for the Hubs to see e.g. the distribution of played maps? Should single maps in the pool be time limited? Discussion allowed! Who would be willing to work on a Hub webpage? This Hub could serve as a playtesting Hub of WIP maps at first, as the supply for these maps is still fairly low. It could then later down the line transform into a Hub for finished maps only. Time will tell. The map pool can also be larger than on 5vs5 as learning these maps is not as time consuming. Awesome plan @El_Exodus, sounds like a really smooth process for players (once you are in Faceit – I haven’t managed playing yet). And I’d be happy to help building the page, I discussed a bit with @Thrik in the past about helping out, so I’d be happy to work with you guys to help make this successful. Finally I finished the stats of the maps/Hub! I know I'm not professional but I tried my best, I hope this data could be helpful for the mapmakers to improve. Sadly few matchs were played and the sample isn't very large, so the info is not 100% reliable. I've worked on something a couple of weeks back (https://compassionate-bell-62f5f1.bitballoon.com/) after the topic was discussed in the discord hub chat. I'm not sure if someone is in contact with Faceit about this, but it's something that needs to be resolved to make the whole plan work. The page can use some content (text, images, structure), it's something I would like to handover to someone else or at least collaborate with someone with. For me it was just a fun experiment with the steam and faceit API's, and thus finished my personal goals for the project. That said, I'm open to work some more on it. I have messaged regarding this and was going to contact you as well, I was wondering regarding the state of things and seems it's clear where you are at I'm happy to start something, I was just wondering if, being something in collaboration with Faceit, it should recall some of their design as well - I mean if that's a requirement. Donations of faceit points are now enabled. We can use this points budget to create tournaments and events on Mapcore maps. our next mappool. Starting at the end of the month. it's going to be a double edged sword for sure. We're going to get a lot of interest in the hubs but I'm still worried we're going to get lots of people *just* wanting that map. We're currently building up a new mappool for the next season. if you want to be considered PM myself or one of the other admins, or drop your map ws link here! 'Comp' maps obviously the focus. Golden, 5 vs 5 competitive defusal map for CS:GO.